With the Concrete Interior Prep System, you pick what you need for your specific project, order exactly the right quantity of exactly the right product you need and then get step by step instructions on how to apply it. Super Blue quickly penetrates and dissolves lime deposits, mortar, scale, rust stains, etc. Used during the prep process to clean and remove contaminates, leaving you with the finish you’re looking for. Dilute 1:9 with water. When diluted, covers 1500 Square Feet per gallon (150 non-diluted). There are four steps to the entire process. You can download and print off these instructions here. and lift any remaining dirt from the floor. 2. 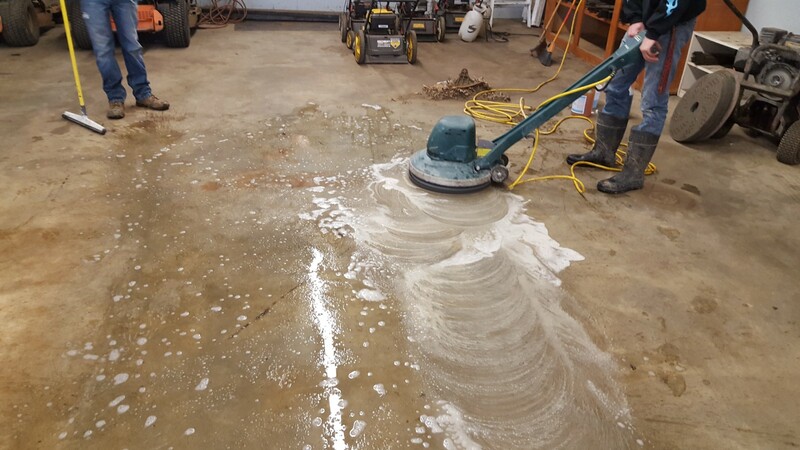 Squeegee and Vac the dirty water from the floor before it dries. Concrete finishing jobs are relative to the job, and no two jobs are the same! Use the information provided above to select the products you need, then select “Add To Cart” and get everything you need for a Concrete Prep job shipped to your front door.